I hope you all had a wonderful Christmas with your families. We had a great time with ours at home and now I'm out of town visiting my grandparents. Loving it!! 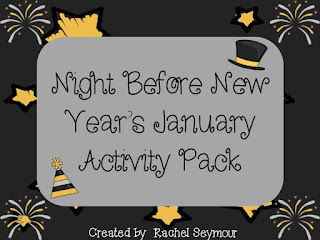 I have finished my Night Before New Year's January Activity Pack and it has a lot of fun activities. 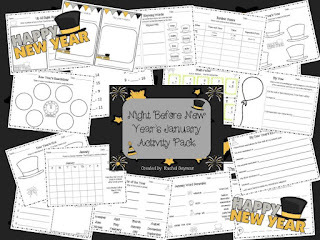 This pack was inspired by The Night Before New Year's by Natasha Wing. I will read this story to my kiddos as soon as we get back. They love her stories. A couple of my favorite gifts were Pride and Prejudice (one of my all time favorite movies) and my waffle maker. Yummy!! If you're not one of the first 3 to receive my new pack for free it will be on sale in my TpT store until New Year's Day so snag it up! Rachel, this looks amazing! My favorite Christmas gift was my iPad. I'm still learning how to use it! Happy New Year to you! I love my spa gift card! This package looks like a lot of fun! My favorite gift was a collection of perfumes that I love. Looks like a great pack! This would be fun to do with my class.